Oooh, Shinies! : Mont Blue Giveaway! Thanks to the lovely people from Mont Blue, I'm giving away a set of 3 glass nail files! 1 lucky winner will receive all 3 nail files as shown on the picture above, which are hand decorated with Swarovski crystals and come with black velvet sleeves. You can read more about this specific set here. 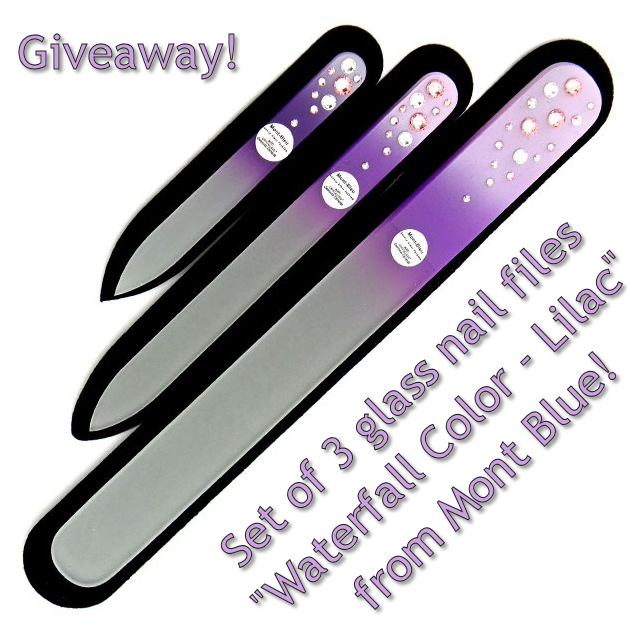 - There will be one winner, who will receive the nail file set "Waterfall Color - Lilac" as shown above. - After the winner has replied, I will send the winner's contact information to Mont Blue, who will take it from there. - Mont Blue will ship the prize directly to the winner.